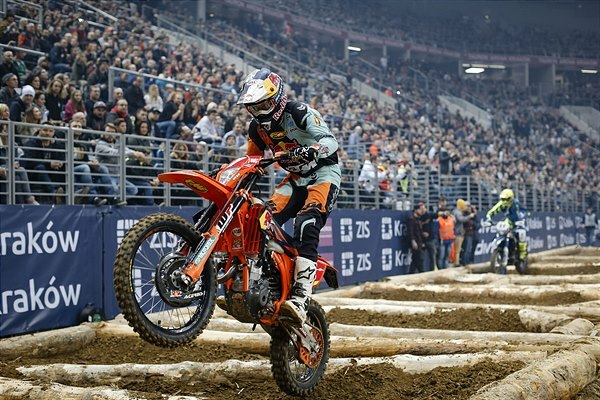 On a dry and fast track at the Tauron Arena in Krakow, Taddy Blazusiak delighted his home fans by taking the overall win at round one of the championship. It wasn’t plain sailing for the six-time champion however as an early fall in the third and final heat left him playing catch-up to the riders ahead. With his KTM 350 EXC-F blasting off the line, Blazusiak secured the holeshot in heat one. The Polish rider was never challenged for the remainder of the race and after riding eight smooth and consistent laps crossed the line 15 seconds ahead of teammate Webb. Putting in a similar performance in the reverse-grid heat two, Taddy fought his way through the pack early on to win by over five seconds from the second-placed finisher Colton Haaker. 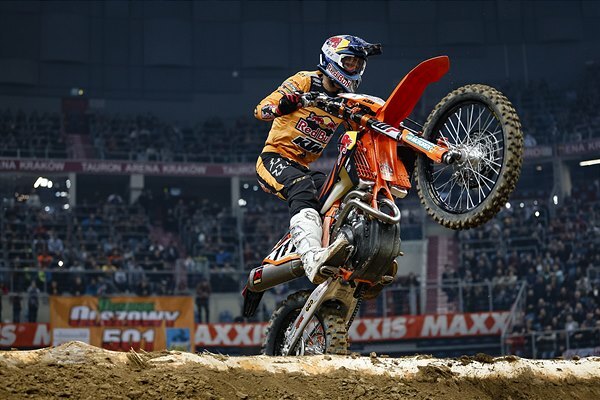 With two runner-up finishes and a third-place result, FMF KTM Factory Racing’s Cody Webb enjoyed a strong start to the defence of his 2018 SuperEnduro title. After claiming the SuperPole award, the American rider fought hard throughout the three races with EnduroCross rival Colton Haaker. Despite a couple of mistakes, Webb was able to ride consistently over the three heats to take second overall, just two points behind Blazusiak.